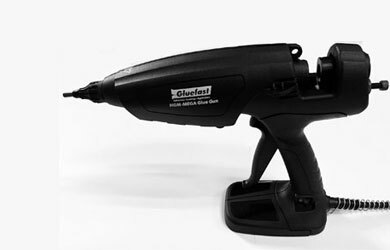 The HMG-HD3 heavy-duty hot melt glue gun model from The Gluefast Company, Inc. is ready for 24/7 usage in a variety of gluing applications. 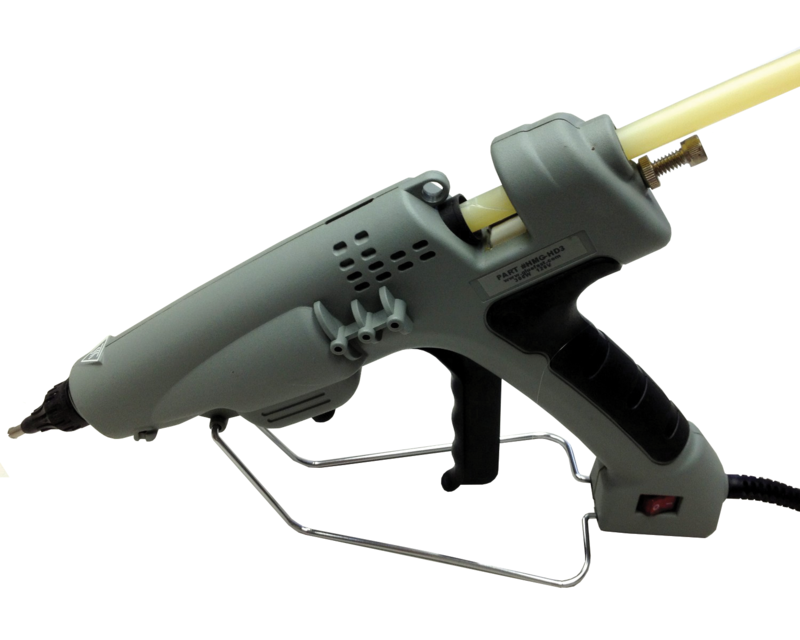 This adhesive applicator comes equipped with stroke adjustment screws that control flow amount, an on/off switch that allow users to turn off the gun without unplugging, an adjustable thermostat, an ergonomic handle, and a strong integrated support stand. A huge 4-pound per hour melt rate! HMG-NAD is an adapter needed for HMG-N1 and HMG-ND nozzles. HMG-N1 nozzle applies 5 thin strips of adhesive 1/8" apart (for use with HMG-HD3 only). HMG-ND has a larger opening to apply a larger drop of adhesive. 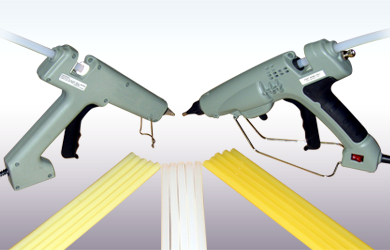 HMG-NH is the standard nozzle for the HMG- HD3 Heavy Duty Glue Gun. Hot melt glue guns are typically classified as low-temperature or high-temperature. Low-temperature glue guns usually heat up to about 250°F and are well suited for delicate work, such as applying adhesive to lace or cloth. 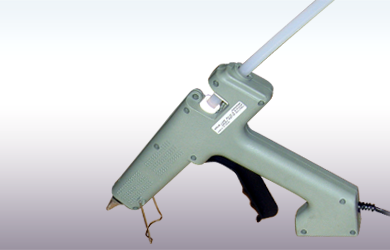 High-temperature hot melt glue guns generally heat up to around 380°F and are used for heavy-duty projects. The added advantage of a variable temperature control means that the HMG-HD3 hot melt glue gun allows a user to complete a wide range of projects with all glue stick types. 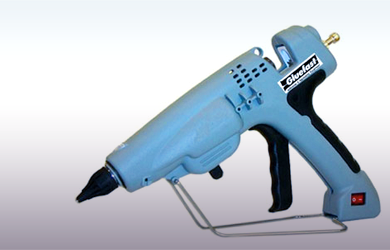 For operations that require versatility at an economical price, Gluefast’s HMG-HD3 hot melt glue gun is the only choice. Although this model is compatible with a vast array of glue sticks, selecting the one that best matches your application needs will help you maximize performance. 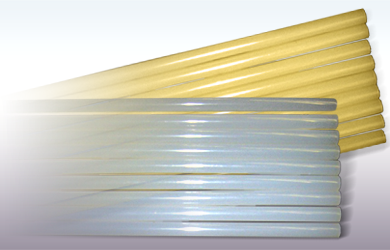 See our assortment of hot melt glue sticks for product-specific information. Have a particular gluing problem? 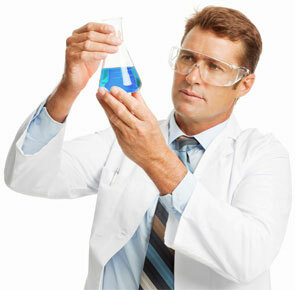 Need a uniquely formulated adhesive? Click here to ask a question.